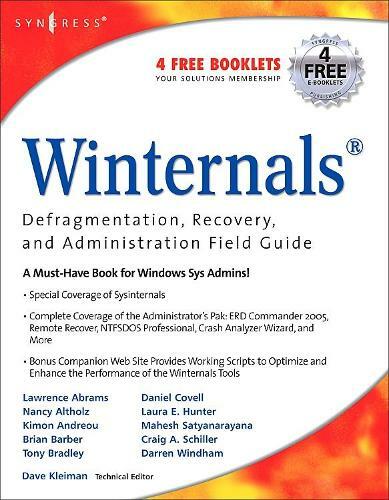 The only book available for the market leading Winternals tools used in over 70,000 Microsoft networks worldwide. The book begins with a chapter describing the most common challenges faced by system administrators related to system recovery, data backup and system performance enhancements. The next chapters introduce the readers to the complete suite of Winternals solutions including Recovery Manager, Defrag Manager, and the Administrator's Pak which repairs unbootable or locked-out systems, restores lost data, and removes malware from infected machines. Chapters on the Administrator' Pak detail all the components of this powerful suite of tools including: ERD Commander 2005, Remote Recover, NTFSDOS Professional, Crash Analyzer Wizard, FileRestore, Filemon Enterprise Edition, Regmon Enterprise Edition, AD Explorer, Insight for Active Directory, and TCP Tools. Each of these chapters details the complete functionality of all tools, and also provides detailed examples for using all tools in relatively simple to extremely complex scenarios. The chapters and companion Web site also include dozens of working scripts to automate many data recovery, backup, and performance enhancement tasks.